A Damsel In Distress is a new(ish) musical confection that feels like it's been around for years. Based on the P.G.Wodehouse story and drawing upon the Gershwin brothers' songs that were composed for the similarly inspired 1937 movie, Jeremy Sams and Robert Hudson breathe life into a collection of classic concepts. In all honesty, the fable’s ridiculous plot defies both and credibility and description. George Bevan, a gifted American musical theatre composer falls for Maud Marshmoreton, a titled young Englishwoman, who is herself the ward of the fearsomely dragon-esque Lady Caroline. Maud's father Lord Marshmoreton is an elderly landed gent with a keen eye for both horticulture and women and who in turn is smitten by Billie Dore an American actress in Bevan’s most recent show. (Keep up!) Besides these paramours, there are yet more romantic shenanigans and all set in a tale that hops between London's Savoy Theatre and the crumbling Gloucestershire stately pile of Totleigh Towers, as the cultural differences that straddle the Atlantic are affectionately mocked throughout. Making his Chichester debut, Rob Ashford directs and choreographs with his trademark vivacity and visual flair. In this show the tap doesn’t drip, it gushes. Ashford has ripped out the Overture, (evidently a late change as it’s listed in the programme) so Things Are Looking Up opens the show, setting the tone with a full ensemble tap routine. Other dance highlights include the French Pastry Walk – the first time that most people will have seen a cakewalk performed with real cakes. 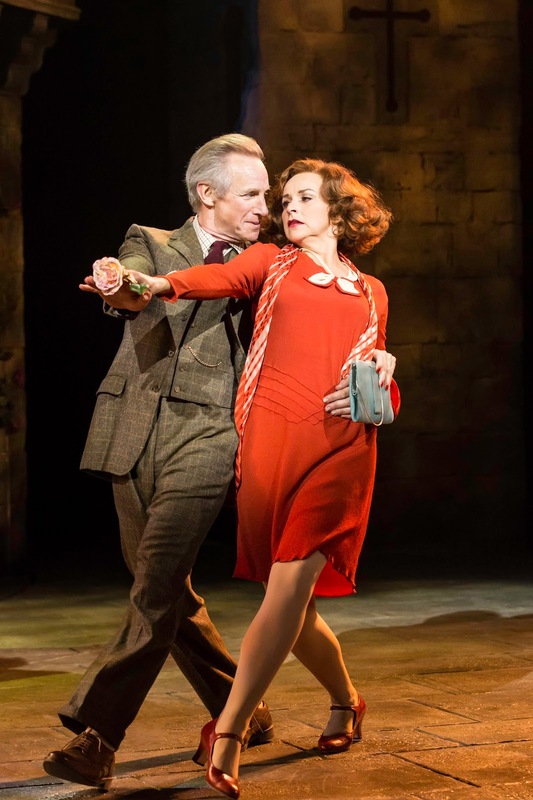 Fidgety Feet proves another absolute joy to watch whilst Stiff Upper Lip gloriously defines the very British attitude of sang-froid through it's polar opposite: the tap dance! Marvellous stuff. Whilst the story maybe 100% saccharine, the songs are diamonds and the cast is platinum. Summer Strallen and Richard Fleeshman are Maud and Bevan. Nobody does young romantic better than these two and amidst Totleigh Towers’ faux Middle Ages splendour, the challenge that the upstart American offers to Maud’s rigid adherence to the social mores is perfectly matched. Other delights include Melle Stewart’s housemaid Alice, finding her true love “above stairs”, Chloe Hart and David Robert’s hilarious kitchen-based duet and Desmond Barrit’s wonderfully withering Keggs, the Butler. The show makes for a whirl through the songbook – the star numbers being A Foggy Day (Fleeshman, divine) and Nice Work If You Can Get It (Stewart and Strallen, likewise) whilst Farrell’s Mine, sung to his roses, is comedy gold. Christopher Oram’s sumptuous set is a mille-feuille of crennelation, whilst from a lofty perch Alan William’s band makes fine work of the Gershwin classics. Ideally suited to Chichester’s charms, A Damsel In Distress makes for a delightful night in the theatre.